The Turkey-backed Free Syrian Army (FSA) fighters were deployed Thursday night to the Azaz region in northern Syria near the Turkish border with the goal of encircling Afrin held by the PKK-affiliated People's Protection Units (YPG). 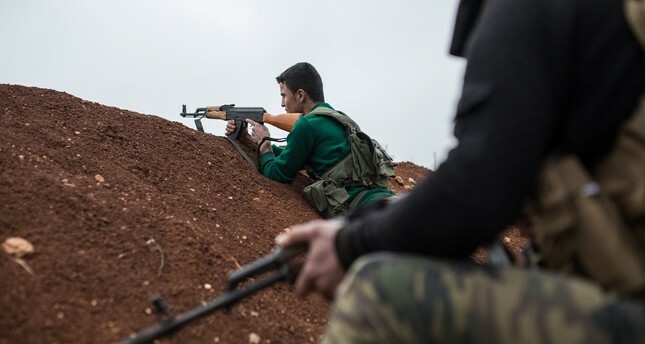 Sources from the ground said FSA fighters with heavy weapons were deployed along the border with Afrin against attacks from the YPG terror group and built check points on the Afrin highway to prevent possible bomb attacks. The Russian military also started to withdraw its forces from Afrin, according to an Anadolu Agency report. A convoy of FSA fighters carrying Turkish flags who entered Azaz in the late hours of Thursday from different parts of northern Syria's opposition-held districts said they will be doing their parts in Turkey's expected Afrin operation against the YPG. On Friday, 12 mental patients in a psychiatric hospital and maternity hospital in Azaz were injured in attacks by the YPG. Meanwhile, intelligence sources reported that the YPG is also expanding its deployment in Afrin and Manbij, stationing more than 140 vehicles in the districts and preventing civilians from fleeing the region. An operation in Afrin is currently being considered as imminent in the wake of Turkey's successful seven-month Operation Euphrates Shield in northern Syria, which ended in March 2017. The Bashar Assad regime handed over Afrin to the PYD/YPG without putting up a fight, and there are currently some 8,000-10,000 terrorists in the area, according to information gathered by Anadolu Agency.